Daktronics comprehensive line of Fuelight™ gas price displays are specifically designed for the petroleum industry with high-contrast, full-height, broad-stroke digits that provide clear and highly legible fuel prices. The displays feature energy-efficient LED technology with outstanding visibility and impressive viewing angles. The groundbreaking Fuelight 3000 series drop-in petroleum price display has fully sealed digits, components, and connectors provide uninterrupted performance, even in harsh weather. Fuelight 3000 displays create a better view response because of the wide-stroke, full-height digits that fill the display cabinet. Fully sealed digits, components, and connectors provide complete weather protection. Choose from these sizes: 8", 12", 16", 18", 24", 30", 36", or 48"
Add a cash/credit display to your signage to advertise different prices for different types of fuel payments. Give your customers an incentive to pay with cash, which can help you save money on credit card fees. Three standard messages are available: "Cash," "Credit," and "Debit." Promote our new Cash/Credit LED display to the convenience stores in your area. 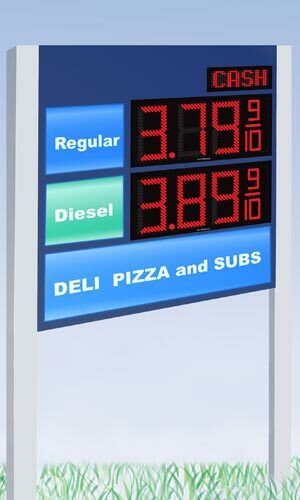 This display can significantly lower a fuel retailer’s interchange fees and increase their profits. How? The Cash/Credit display in the upper, right-hand corner works with Fuelight digit displays. The Cash/Credit LED display, when used with Fuelight™ petroleum price displays, shows three fuel prices depending on the payment method: “Cash,” “Credit,” and “Debit.” When customers notice the rates, they will pay by cash or debit for discount prices. 66% of customers will pay cash to save 5 cents/gallon. 78% are ready to change from using credit cards to debit cards.